Brendan Easter of Midlothian was about seven years old when he discovered the world of speedcubing and eight when he got bit by the theatre arts bug. The two passions collided when Brendan brought his cubes to a CharacterWorks play rehearsal to keep busy between scenes. His mom, Shannon Easter, says speedcubing – solving a variety of twisty puzzles, like the Rubik’s Cube, as quickly as possible – has helped Brendan develop more patience and persistence. For Brendan, now eleven, speed-cubing is much more than a way to ward off boredom at play practice. It’s a passion. Before a speedcubing competition, Brendan practices frequently, sometimes solving one hundred times in a day. “One of my favorite things to do is walk around solving a cube,” he says. Brendan and his two older sisters, Gabi, seventeen, and Samantha, thirteen, enjoy many passions and interests that may not directly prepare them for careers, but do teach lessons they will carry throughout their lives. In addition to speedcubing, the Easter children sing, act, swim, and play musical instruments. Brendan is also passionate about reptiles, like his pet milk snake, but his sisters don’t share that particular passion. 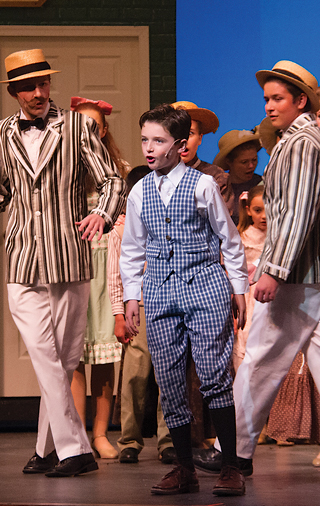 Of all the Easter children, 13-year-old Samantha is most passionate about theatre arts. “With these passions, I don’t have to push them,” says Shannon. “They want to learn and get better, and they put in the work needed to do so.” As the three Easter children work on improving their performing arts skills, their mom says they are developing a strong work ethic. While all the Easter kids have learned valuable lessons from CharacterWorks – a regional children’s theatre – each has taken away something different. Gabi, seventeen, hopes to work as a missionary one day. Brendan – the speedcuber extraordinaire – became involved with CharacterWorks because his older sisters were having so much fun. “But now, CharacterWorks is a big part of my life,” Brendan says. “It has given me a place to grow in my confidence and make great friends.” In fact, one of those CharacterWorks friends started speedcubing and competed with Brendan at a VCU event this spring. Combining passion and pragmatism, Brendan says his time at CharacterWorks will prepare him for his dream career: hosting a television show that teaches kids about reptiles. CharacterWorks first came to Richmond in the fall of 2001, although at that time it was known as Christian Youth Theater. 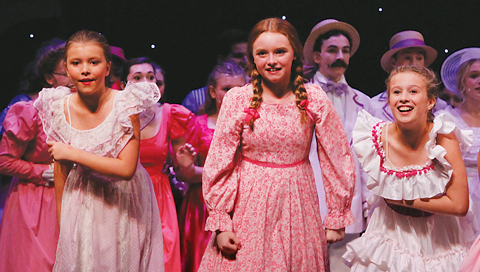 Managing Director Donna Amadee had just started homeschooling her two younger kids (the older two had already left the nest) when a friend told her about a touring kids’ drama group that was launching. Before she knew it, Donna found herself in charge, and the program blossomed. Though both her son and daughter, Dave and Wendy, performed in many shows and had leading roles, neither has performed on stage since their CharacterWorks days. Both, however, learned valuable skills that have gotten them through challenging situations, and both continue to use those skills today. When Donna’s daughter Wendy was applying to colleges, she had her heart set on attending a small Christian school. The problem? Her SAT scores were below the requirement. For her interview with the admissions office, Donna encouraged Wendy to call on her acting experience. “I told her to play the part of someone who had really high scores.” Wendy sold the role and was accepted because of her impressive background; she even ended up graduating at the top of her class. 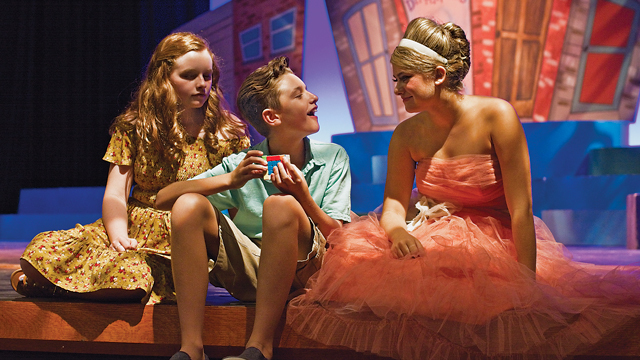 Like the Amadees and the Easters, every CharacterWorks family you talk to could share stories about the ways in which their kids’ experiences working to put together a show has helped them in non-theatre situations. For some, participating in CharacterWorks has helped them become comfortable with public speaking, while others have learned how to take direction and apply it. Others have realized they can take on risks and try things they aren’t absolutely certain they can do. One day, Brendan hopes to connect his passions of performing and reptiles. The lessons of overcoming disappointments and being a good friend will come to life in CharacterWorks’ next show, Junie B. Jones, at Kingsway Community Church in Midlothian. It will be the company’s eighty-eighth show in Richmond. “During every show,” Donna says, “I have a personal moment. 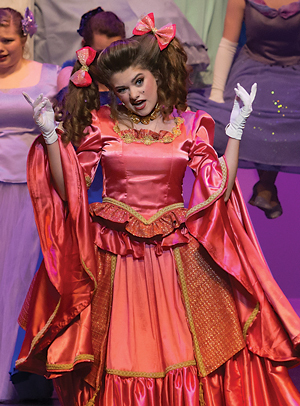 I never know when it’s going to happen, but I just feel overcome.” In all the shows it has presented, CharacterWorks has touched the lives of countless families – including Donna’s – and inspired kids of all ages to live passionately. Just before Brendan Easter discovered his passion for CharacterWorks, he fell in love with cubing – speedcubing to be exact. 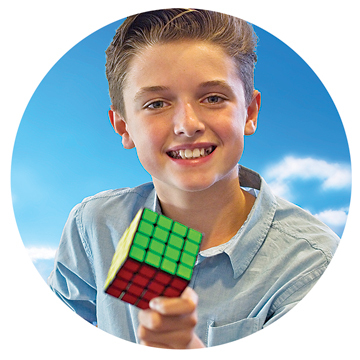 When he was seven, Brendan’s interest was sparked by YouTube videos by speedcubers – of which there are many! A YouTube search of speedcubing videos yields a whopping 726,000 results. After discovering speedcubing online, Brendan asked for his first cube for Christmas and worked on trying to solve it for months, both at home and at CharacterWorks rehearsals. He printed algorithms, watched videos, and kept trying, despite getting frustrated. “This just isn’t working,” he would complain to his mom, Shannon. Brendan persisted, though, until he figured out that the corner needed to be flipped. Voila! the cube was solved, and Brendan was hooked. Since then, speedcubing has become a bit of an obsession. “I found out I could buy speedcubes online that make it faster,” Brendan says. After learning about the different kinds of cubes, Brendan began collecting them. He also figured out his turning style, and he kept getting faster and faster. Though Rubik’s Cubes are the most popular, there are many different types of cubes used in the speedcubing world, such as the Pyraminx, a tetrahedron-shaped 3-layer puzzle; the Skewb, a corner-twisting cube with eight corner pieces and six square center pieces; and the Megaminx, a 12-sided puzzle with fifty moveable pieces. (In his collection, Brendan has those cubes as well as many others, and they boggle the mind!) How does one even attempt to solve a cube with twelve faces?! Last year, Brendan traveled to Fort Wayne, Indiana, to compete with more than 600 other people at CubingUSA Nationals. “It was kind of scary,” he says, but despite the challenges of competing, Brendan enjoyed it. “Watching the winner solve was crazy because he was just so fast,” he says. This past May, VCU hosted Richmond’s third speedcubing competition, and Brendan was excited to participate. Moving forward, Brendan would love to someday set a world record, but he knows he needs to practice even more than he already does. The current world record for solving a 3×3 is under five seconds. He would also like to try blind cubing – believe it or not, that really is a thing. After being inspired by speedcubers on YouTube, Brendan now has his own speedcubing channel. He shares reviews of new cubes he purchases, videos of himself or others solving cubes, and algorithms he has created. “I made my own algorithm on my 5×5,” he tells me, “and I thought, ‘I just did something really cool. I should put that on my YouTube channel!’” That initiative and experience teaching others via video brings Brendan one step closer to his dream career.